The declining economy has been in the headlines for several months now. Each day seems to bring a new crisis for the growing number of consumers struggling to make ends meet. Many people are facing an uncertain financial future due to the loss of a job or other circumstances outside of their control. Others find themselves over their heads in debt due to bad financial decisions and poor money management. The causes may vary but the results are the same which makes eliminating debt a priority for many consumers. 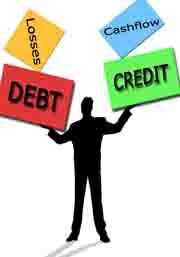 Unfortunately there are no magic tricks that will make your debt simply disappear, there is hope however for those people who are ready and willing to take the necessary steps to get out of debt once and for all. How many people do you know that complain about not having money but continue to use credit cards to pay for purchases? Once the cycle of debt begins it may seem impossible to stop. It starts when you find yourself having trouble fitting your credit card payment into your budget. In an effort to keep your account in good standing you take money allotted for other household expenses and apply it toward your credit card payment. Now you are short money to pay for things like groceries, gas or other bills so you turn around and use your credit card to pay those expenses. If this sound familiar you have to stop the cycle today. For people living paycheck to paycheck this may seem like a formidable task, however if you do not make the decision to stop using credit eventually the decision will be made for you. This happens when you reach your credit limit and no longer have the ability to charge day to day expenses. When this occurs you will undoubtedly choose paying for your housing costs and living expenses over making your credit card payment. Once you have committed yourself to reducing your debt, you will need to do so in an aggressive manner. Start with the account that has either the highest interest rate or smallest balance and begin applying all available monies toward that payment while making the minimum payment on other accounts. Continue paying as much money as possible on the account you selected until the balance is paid off, then take the same amount of money and start paying on the next account. Continue doing this with each account until they are all paid off. Depending on your level of debt this may take months or it may take years. If the thought of paying on your credit card accounts for years is enough to make you sick, consider the consequences if you do not. A lifetime of financial worry and insecurity is often the result when people do not deal with their debt. The journey to financial freedom may not be an easy one, however it is a journey that we must each take to find financial security in our lives. Trisha Wagner is a freelance writer for DepositAccounts.com where you can compare rates of deposit accounts from dozens of banks in one place. Trisha writes regularly on the topics of personal finance and savings accounts. Some good advice here. As I see it, when you spend more than you make, you have 2 options: make more or spend less. The option of making more was not really included in the article, but a 1 day a week job at a reasonable wage can provide a couple of hundred dollars of additional after tax income to help pay off any debt accumulated. What’s more, the more time you spend working, the less time you have to spend your money. Definitely making more is an option and a good one, thanks Darryl.